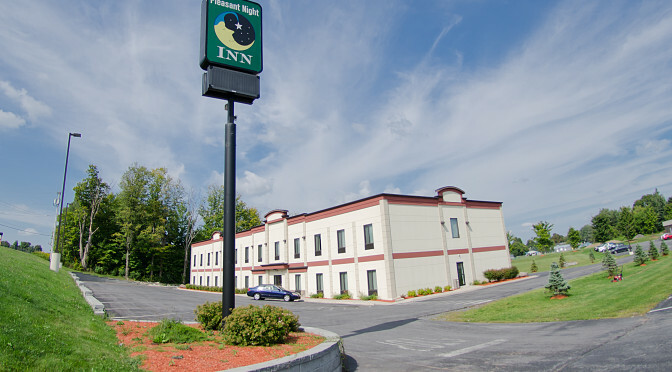 Located just minutes from Fort Drum and Watertown, NY, Pleasant Night Inn is a clean, efficient and eco-friendly hotel with all the comfort you desire, at a price you can afford. The perfect stop for travelers, outdoor enthusiasts, and people who work in and around Fort Drum, the hotel offers pet-friendly, handicapped accessible accommodations with all the amenities you’d expect from such a fine facility. Ask our friendly, professional staff about our outdoor tent receptions for your special occasion, the miles of ATV and snowmobile trails in the area, and the incredible hunting and fishing found in the region. As a proud supporter of the 10th Mountain Division and all who serve in the military, the Pleasant Night Inn offers military discounts.